and Nancy Jane Gamble of Glenone and Lislea, Northern Ireland. NOTES: For details of recent significant additions to the site, and assorted information appearing on other websites, go to NEWS. Please use the Guest Book to leave your comments, information or queries for others to read. Also, take a look at the correspondence page. Please email us if you have any information or photographs which you think should be included on this site. Many thanks to all who have contributed so far. To submit information regarding a member or members of the family a form is available for download by clicking HERE. The author of this site (Peter Keenan) has an account on Facebook. This website contains information about descendants of Henry Keenan (1808 - 1881) and Mary Ann Gamble ( 18??-18?? ) of Glenone and Lislea, County Derry, Northern Ireland. However, the majority of the information relates to one of their sons, Henry John Keenan (1842 - 1889) and his wife Nancy Jane Gamble (1844 - 1926), who married in Northern Ireland in 1863 and emigrated to the east coast of Australia in 1864. As Batlow, NSW, was the town in which they settled, this line is often referred to as the Batlow Keenans. Their first son, Australian-born James Keenan (1864 - 1942), was the author's grandfather. The inspiration for this website came, initially, from George Keenan (son of Aaron Keenan, the second-son), who wrote an article in 1949 headed "A Pioneer Family of Batlow - The Keenans". Three other sons of Henry (1808 - 1881) emigrated to the West coast of Australia. They were Stewart, Robert and Aaron. Through a contact in Western Australia I have discovered - and included on this website - a considerable amount about these three, particularly regarding Stewart, who had 9 children. Two of the children of Henry (1808 - 1881) remained in Northen Ireland. They were James (1847 - 1906) and Elizabeth (18?? - 19??). James married Maria Hastings (1846-1937). Through contacts in Northern Ireland and Scotland I have discovered - and included on this website - a considerable amount about the family of this James. His sister, Elizabeth (Lizzy) Keenan, married ..... Kyle, and I've included what little information I have about her family. Some of James' children emigrated to the USA and I have included information about that too. One of the sons of Henry (1808 - 1881) was named David. He emigrated to New Zealand, but had no children. Confused? To see a diagram/family tree which depicts this overview, click HERE. Henry and Nancy (Anne) arrived in Eastern Australia in 1864 and eventually settled in Batlow, New South Wales. This branch of the Keenan's is sometimes referred to as the "Batlow Keenans", because Batlow in New South Wales is where Henry and Nancy (Anne) settled and raised a family. Henry John Keenan and Nancy Jane Keenan (nee Gamble) The young couple who left Glenone, County Derry, Northern Ireland, in December 1863 and travelled to Australia to start a new life, first in Maryborough, Queensland, and later in Batlow, New South Wales. These pages show details of birth, marriage,	children and death; and also information about the parents and siblings of Henry John and Nancy Jane. [NOTE: Nancy Jane Keenan was known in Australia as Anne (or Ann) Jane Keenan, then, after remarrying, was known as Granny Hopson.] Henry and Nancy had 11 children between 1864 and 1885, but sadly only 6 reached adulthood (see First Generation Australians and/or the first part of their family tree). 1884 was a terrible year for them, with 3 of their children dying from typhoid fever and 1 from accidental burning. By that stage Henry was very sick. He was admitted in a very poor condition to the Gladesville Mental Hospital in September 1885, and died there on 22 June 1889. The journey to Australia aboard "The Prince Consort" Information about the trip to Australia in 1864 by Henry John and Nancy Jane Keenan. Includes a sketch of the ship, a copy of the entry in the book referring to Henry John and Nancy Jane, and the address where a fascinating book about the journey may be obtained. 1949 Batlow Newspaper Article Details of the arrival in Australia of Henry John and Nancy Jane Keenan, their adventures and the family as it existed in 1949. 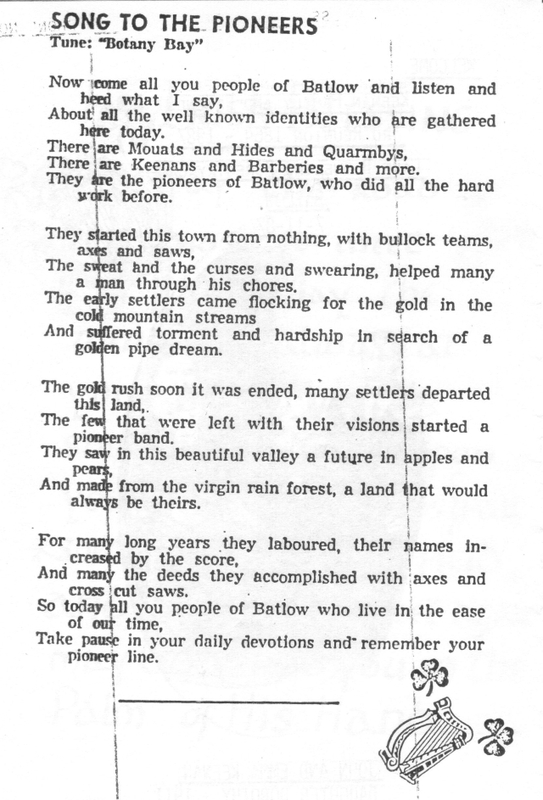 Written by George Aaron Robert Keenan of Batlow (1894 - 1981) and appearing in the Tumut and Adelong Times. Also contains some additional notes by me. the page also contains a tale about Nancy /Ann Jane Keenan (Granny Hopson) taken from the 1975 book "Batlow: The Growing Years From Gold to Apples". 1884 Newspaper Articles About the Typhoid fever which hit Batlow and the family of Henry John and Nancy Jane. Also the burning death of a child and the poor condition of Henry John at that time. About Batlow, New South Wales It was in Batlow that Henry and Nancy settled and raised a family. Many Keenan descendants still live in Batlow and the surrounding area, but there are also many in other parts of NSW (such as Bombowlee, near Tumut, Engadine) and in Victoria. This page includes maps, book titles and internet links concerning Batlow, as well as many photographs, most of which were taken in 2008. The first generation Information about the first generation born in Australia (birth, marriages and deaths). See also the Batlow Pioneers. See also the FAMILY TREE. Tragedy - 5/3/1909 Batlow Newspaper Article In 1909 two young Keenan boys (Eric and Sidney Catherall) were found shot dead in Batlow. Here is a transcript of the first report which appeared in the local paper, the Tumut and Adelong Times. Tragedy - 12/3/1909 Batlow Newspaper Article This is a detailed report from the Tumut and Adelong Times of the Coronial Inquest into the deaths of Eric and Sidney. It finds the death was accidental. But elderly relatives interviewed in the 1990s still had their doubts. The second generation Information about the second generation (birth, marriages and deaths) and FAMILY TREES. The last member of the second generation - Dorothy Mary Lovering - passed away in Sydney on 8 October 2008, aged 98 years. On this page there are links which take users to descendants of the second generation (where such information has been supplied). Keenan Names The names of many of the Keenan descendants of Henry John Keenan and Nancy Jane Gamble. From the first generation to the fourth. More names will be added from time to time. Of course, the current generations are spread out over the east of Australia, but with major concentrations in Batlow and Tumut (NSW), Engadine and other parts of Sydney (NSW), Shepparton (Vic), Geelong (Vic) and Melbourne (Vic). Note: In October 2008 there were approximately 560 Keenan names on the Australian electoral role for New South Wales. Most of these are not descendants of Henry and Nancy/Ann Keenan. But, of course, there would be descendants or the role who don't have a Keenan surname. Photographs Photos of Keenans in Australia and (courtesy of Jack Harkins) Keenans in Northern Ireland. Also, of the ancestral home in Northern Ireland. Photo Gallery - the Brian Keenan collection Photos of Keenans in Australia supplied in June 2008 by Brian Keenan of Queanbeyan, NSW. (Brian Keenan has also supplied a lot of the information that appears on this site concerning the descendants of George Aaron Robert Keenan and Nora Mary Keenan (nee Naughton)). Mrs Anita Beryl Arnold (nee Lovering) Mrs Anita Arnold, of Engadine, Sydney, NSW - daughter of Dorothy Lovering (nee Keenan) (1910 - 2008) and grand-daughter of John Keenan (b.1873) - was the catalyst for this site. Anita, her cousin Robert Keenan and other Keenans in the Engadine area successfully campaigned for a park to be named in honour of their grandfather, John Keenan. For maps showing the location of this park and the location of Engadine, go to the page of John Keenan b. 1873. Keenan Family Reunions Members of the Keenan family of Engadine, New South Wales, stage an afternoon get-together and barbeque in Sydney in October each year. The person to contact regarding this event is Mr Robert Keenan of Engadine, who has set up a Facebook page named "Keenan/gamble australia, UK PORTGLENONE, Ohio USA". For many years the reunions were organised by Mrs Anita Arnold of Engadine, but in 2013 she wrote to me as follows: " ... This will probably be the last one I organise as my eyes are failing me and if I can't see and can't drive, no reunion for me...." From time to time	reunions have been attended by family members from Victoria, Western Australia, Canada and the USA. Documents Various Keenan family documents old and new, plus bits of information appearing in registers. Photographs, Paintings and Sketches of Australia Scenes of Australia. Also, maps comparing the size of Australia with Britain and Ireland, and other countries. Barry Crocker, a legendary Australian singer, television performer and actor, appears to be the only showbiz celebrity in the Keenan family. Barry (b.1935) is a grandson of Mary Keenan, one of Henry and Nancy Keenan's 11 children. Click HERE for Barry's account of how Mary Keenan came to marry John (Jock) Houston; to see a couple of photos of Barry, to see him perform "Stairway To Heaven" on television (YouTube), and to see the official transcript of an extensive interview with him on ABC television in 2006. October 2012: Barry's latest TV work is as co-star of "The Strange Calls" a comedy series on ABC TV. Links to relevant web sites A special page for links to websites in Australia and overseas concerning ancestry and news, including other selected Keenan family websites in Australia. Note, however, that there are many more links on other pages of this website. About Glenone, Inishrush and Portglenone, Northern Ireland Henry John Keenan was born and lived until departing for Australia in Glenone. The main village nearby is Portglenone. The township of Portglenone is beside the Bann River. The main part of the township is in County Antrim, while the rest is on the other side of the river in County Derry (or Londonderry). Henry lived on the Derry side, in Glenone, which is near the villages of Lislea, Tamlaght O'Crilly, Clady and Inishrush. Glenone is understood to mean "meadow of two rivers", the rivers being River Bann and the Clady River. This page of the website contains information, maps and photographs. Henry's wife, Nancy (Anne) Keenan (nee Gamble), was born and raised in Lislea, which is near Glenone. This page also contains many LINKS to other websites containing information about the area. Mary (May) Keenan, (b.1924) lives in Inishrush, near Portglenone, Northern Ireland (see Photographs). Her home is close to the Glenone farm where the Keenans lived for many years. It is about 45 minute by car West from Belfast. May is apparently the last of the "Glenone" Keenan's. The link, for those, like me, who are descendants of Henry John Keenan (b.1842), is that May Keenan's grandfather, James Keenan, was Henry John's brother. Sheila Johnson (nee Harkins) is May Keenan's niece. Sheila passed away in November 2013. Her husband, Richard, lives in Bangor, County Down, Northern Ireland, which is about a 20 minute drive East of Belfast. 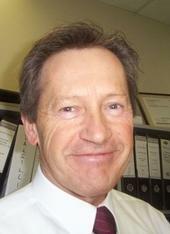 Sheila's brother, Jack Harkins, lives in Findochty, Morayshire, Scotland (see Photographs). Jack's wife, Mary, passed away in November 2015. In 2002 I met with Jack at Fingask Castle (Rait, Perth, Scotland) where he was staying for a work function. I had the pleasure of meeting May, Sheila, Richard and Jack in 2002, and still keep in touch with May and Jack. See the correspondence page for an informative letter from Sheila on 24/9/2008. Click HERE for old photos, supplied by Sheila and Jack, of some of the Irish and Scottish Keenans. In 2002 Sheila and Richard took my wife and I on a trip from Belfast, along the Antrim Coast to Cushendall (for lunch), then across to Kilrea, via Ballymoney, and on to Inishrush to meet May Keenan. Karen Topping (nee Karen D Keenan) lives in Largs, North Ayrshire, Scotland. Largs is a popular sea-side town on Scotland's west coast, not far from Glasgow. In May 2011 Karen [see photo] and her daughter Katrina visited Melbourne, Australia, and I had the immense pleasure of meeting them. I communicate regularly with Karen on Facebook and via email. Karen has supplied details of her family tree, which will be incorporated in mine. Karen and her husband, Richard, own some holiday apartments in Largs. In August 2018 I had the huge pleasure of being in Largs for two days, staying at one of their apartments and seeing some beautiful sites with Karen. I've also been communicating with Hazel Smith and Lynda Palmer (sisters), who live in Largs, North Ayrshire, Scotland. They are descendants (great-great-grandchildren) of James Keenan and Maria Hastings of Northern Ireland. In August 2018, while staying in Largs with Karen Topping, I met up with Hazel and the three of us spent time chatting over breakfast and sightseeing. John Kerr of Coleraine, County Derry, Northern Ireland, is a relative on the Gamble side. My great grandmother, Nancy Jane Gamble (m. Keenan, then m. Hopson) and his grandmother, Elizabeth Gamble (m. Kerr), were sisters. (Nancy Jane Gamble 1844-1926; Elizabeth Gamble 1858-1935.) After writing to one another for a while, I met John in Melbourne in November 2016. He too is a genealogist and has lots of information about the Gambles of Lislea and Kilrea. I will be publishing some of it soon (written November 2016). In August 2018, I stayed with John and his wife, Carol, for three days. They were extremely generous, and John took me to see several towns, people and sites in the area, including the sites of the Gamble and Keenan homes in Lislea and Glenone. News from Northern Ireland and Portglenone Recent news stories and articles from overseas news sources (commencing 12/7/2008). "Johnstone's Farewell" A song written by Robert Johnstone in the 1800's on leaving Portglenone and going to Melbourne, Australia. This song is published in a 1928 book by R. M. Sibbett titled "On the Shining Bann - Records of an Ulster Manor" (ISBN 1-873401-04-3 & ISBN 1-873345-05-4). As well as providing a transcript of this song, I hope to include on the same webpage extracts of several observations made by Mr Sibbett in his wonderful book. Mr Sibbett's book is now (August 2012) available on CD in .pdf format, from the North of Ireland Family History Society	(www.nifhs.org/publications.htm). Ulster Covenant In 1912 nearly half a million Irish Protestants from Ulster signed an oath, a call to defend Ulster from Home Rule (from an Irish Parliament with responsibility for domestic affairs over all of Ireland). In Ulster resistance to Home Rule had existed for many years, particularly since the first Home Rule bill was introduced in the British parliament in 1886. Many Keenans and Gambles were among the Unionists who signed the 1912 Ulster Covenant. For more information go to this page. Before Henry John and Nancy (Anne) Jane Keenan settled in Batlow, New South Wales, Henry's brother, Stewart Keenan and his wife, Isabella Gamble (possible a sister or cousin of Nancy Jane) migrated to Australia in 1859 and settled in the south-west of Western Australia. The first page below includes information about the children of Stewart and Isabella. Also on this page are a photograph of Stewart and Isabella, recent photographs and a great deal of information about "Glenbourne Homestead" - the (heritage listed) house at Margaret River built by Stewart and Isabella - and links to more information. The late Edward (Ray) Keenan (d.2004) of Perenjori, Western Australia, transcribed letters sent by Keenans between America, South Africa, Western Australia and Northern Ireland from 1873 to 1955 . He published these 23 pages in 2003. Included are letters from David Keenan of Providence, USA, Grace Catherall (nee Keenan) who lived for a while in South Africa, and James and Maria Keenan of NI, Annie Jane McKay (nee Keenan) of NI, Mary Houston (nee Keenan) and many others. (Thanks to Anne Waghorn of WA for supplying this material.) TASK COMPLETED 25/4/2010. Link to Keenan genealogy website An excellent and easy-to-use website by Gil Hardwick of Margaret River, entitled "Pioneer Families of the Lower South West of Western Australia", with lots of information which may also by of interest to their Keenan cousins in eastern Australia (aka "the Batlow branch"). Look under K in Gil's index. 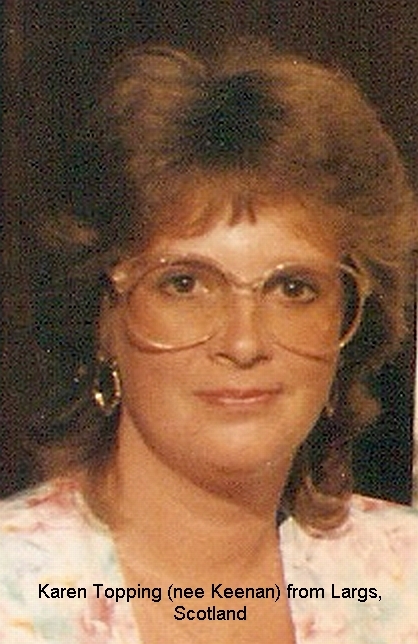 Kay Kuebeler (nee Keenan) Kay Kuebeler is a distant relative who lives in Florida, USA. Her great-grandparents were John Keenan (b.1847) and Elizabeth Gamble (b. 1849). They married in Wheeling, West Virginia, USA, in 1872. John Keenan's father was Daniel Keenan (died 1872) and his mother was Eliza Wallace (died 1877), both of Tyanee, County Derry, Northern Ireland. It appears that Kay's great-great grandfather (Daniel) and my great-great grandfather were brothers. On this page you will find links to Kay's own website and to Keenan family photos she has posted on line at another site. Other American relatives with whom I occassionally communicate include Marge and Bill Golder of Port Orange, Florida and Jim J Keenan of North Canton, Ohio. In Canada, Marina Hehn is another active and valued member of our Keenan family genealogy group. She has visited Keenans relatives in Australia, Northern Ireland and Scotland. Family Trees (Latest addition or change 13 December 2018) Several Keenan family trees, in flow chart style, have been created and are linked together by hyperlinks. 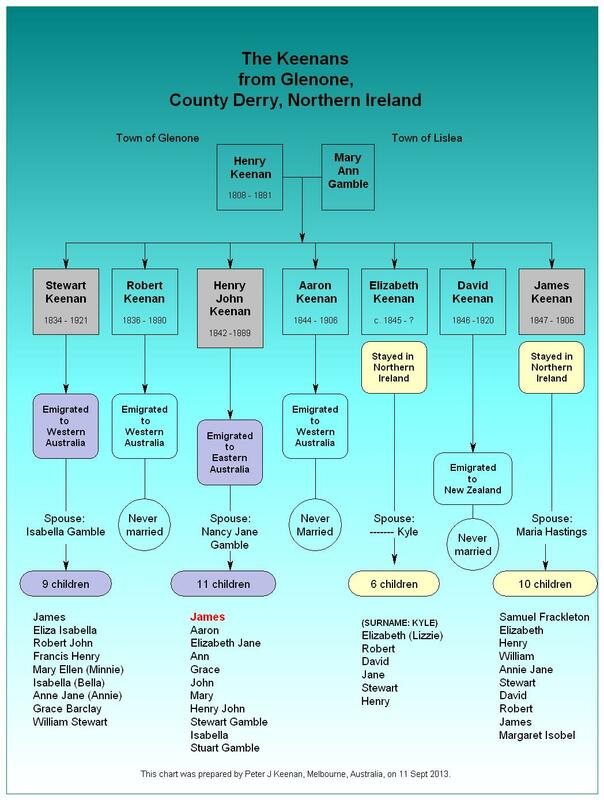 The earliest family tree shows what I know of the start of the Keenan branch in the Glenone/Lislea district of County Derry, Northern Ireland. Then there are (or will be) hyperlinks to other charts for descendants in Australia, and also for those in Northern Ireland, Scotland and the USA. This is a work-in-progress. Other Family Trees In the chapter "The Keenans of Eastern Australia" there are other sections which contain additional family trees presented in a different manner: see "The first generation" and "The second generation". News about this site Look here for information about developments and changes to the website. Correspondence Some recent correspondence with members of the Keenan clan in Australia, Northern Ireland and other parts of the world. Australian Cultural and Ethnic Groups See the classifications devised by the Australian Bureau of Statistics. Note: the Northern Irish are classified as Irish. The Scottish are classified as British. Off-topic Writings and Speeches Examples: "American Declaration of Independence"; "The Gettysburg Address"; "I Have a Dream". Australian English/Slang A bit of fun. Needs a lot more content. Peter Keenan's blog: Keenans Online My old blog site with some information, links to some of my favourite sites, rants and family photographs. Please email us if you have any information or photographs which you think should be included on this site. Many thanks to all who have contributed so far. "After all is said and done, a lot more will be said than done." THIS SITE COMMENCED ON 4 MAY 2006 AND IS BEING DEVELOPED AND UPDATED AS TIME PERMITS.